Miami Club Casino claim to offer “the most competitive VIP club in the industry” that is aimed to reward players for their loyalty every time they play. All players are automatically enrolled to the basic tier of VIP membership (Flamingo) when they make their initial deposit, and this makes them eligible to receive extra bonuses and prizes every month, including match bonuses, reloads, and free coupons (see below). There are six levels of VIP membership, with the most prestigious, Millionaire’s Row, being open to those who have earned over a million comp points and thus giving them the chance to benefit from the best bonus offers available at Miami Club. Miami Club Casino takes all the necessary precautions to protect players. 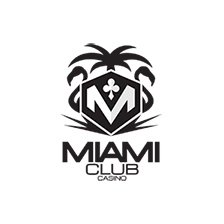 Any sensitive area of the casino is protected with 128-bit SSL encryption. This technology obscures your personal and financial data as it travels to the casino’s firewalled server. Additional advanced billing techniques are used to safeguard credit card information. Miami Club Casino states that the WGS Technology platform it uses a genuinely random number generator. However, the casino has not posted any audit information. Because other casinos in the group have been proven fair, we fully believe Miami Club Casino is also fair. However, a seal of fairness from an auditing firm would be useful for players who are unfamiliar with the group.